Only a few weeks after their debut EP dropped, The Hum Drums are back with their latest slab of fried garage blues - ‘MAKER/BREAKER’ is packed with huge fuzzed-out riffs, pounding drums and a guitar solo that just won’t quit. After gigging around Melbourne for the better part of a year, garage duo The Hum Drums have had a pretty intense month. In late March they dropped their debut EP Vol. I, a collection of blown-out garage blues, and only a few weeks later they’re back with a brand new single ‘MAKER/BREAKER’ and the first taste of Vol. II. But despite the incredibly quick follow up, this definitely isn’t half-arsed - lasting a good two minutes longer than any track on their debut, the boys are pushing themselves into new territory and letting their dirty hair down. After the rumbling of a fried guitar ‘MAKER/BREAKER’ bursts open with an explosive backbeat and a enormous fuzzed-out riff. As things strip back, we get a taste of the swampy blues the boys perfected on the first EP with vocalist Jake Ryan’s soulful voice sliding over the top. But soon enough, The Hum Drums pounding away again, guitars bleed and Jake howls. Considering there’s just two of them, The Hum Drums can make a whole lot of noise. Eventually, things cool off a little more and a new psychedelic influence starts to creep in, with a powerful, atmospheric guitar solo. Finally, in true Hum Drums fashion, the track explodes open once more, leaving no survivors before it’s suddenly gone. 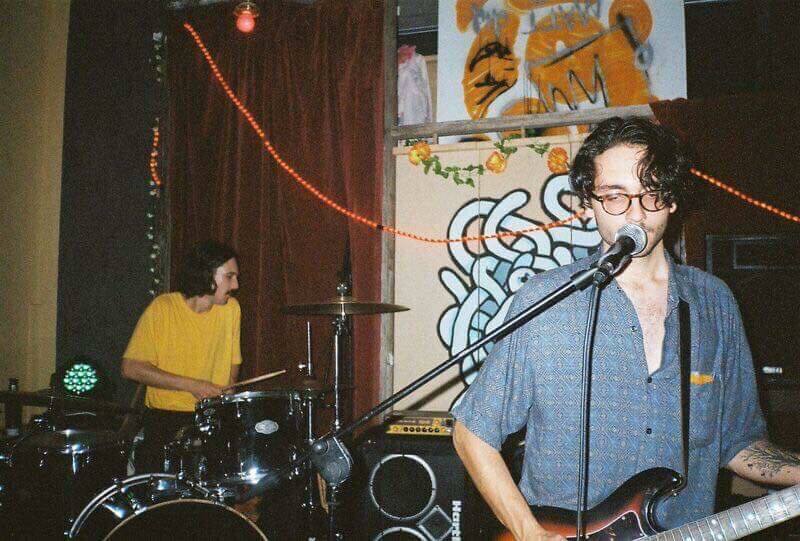 ‘MAKER/BREAKER’ is a huge (sort of) comeback for The Hum Drums, so to get the low down on what’s been going on we chatted with Greg and Jake from the band. TJ: For the uninitiated, want to tell us a bit about The Hum Drums? Greg: I purchased a drum kit about a year ago with absolutely no intention on playing in a band. I just wanted to learn some basics. Jake and I would play really trashy blues stuff. It was fun but not serious at all. We would send each other different hip-hop and blues music, and I think that kind of inspired us to start writing some tunes. Jake: We pretty much booked a gig with a few of our mates before we really even wrote the tunes which ended up being on our first EP - I don't even think we had a name. We ended up just jamming constantly for about a month until we landed on The Hum Drums for the gig, and that was that. The new single ‘MAKER/BREAKER’ is wild. What’s the story behind the track? Jake: Lyrically speaking, the song is pretty grim - I think it stemmed from the riff itself when we were jamming it out. I guess it's about the dual nature of a creator ultimately being a destroyer in some way, whether it's of itself or others around it. Jesus, it hasn’t even been a month since you released your debut EP Vol. I. What’s going on? Greg: Haha! We had recorded both EPs around the same time, with initial plans to release them further apart, but we started to go insane! We had heard the songs too many times and contemplated making changes to the already recorded EP. So our mentality has been to just record, mix and release straight away. No sitting on material for too long. Jake: Yeah, we were trying to write pretty quickly and kinda put stuff out there before riffs and ideas went stale on us. We had about a month of sitting in this lounge room where we set up shop and tried to bash out as many tunes as possible. Despite such a quick turn around between releases, ‘MAKER/BREAKER’ definitely feels separate from Vol. I. What’s changed in such a short time? Jake: The tracks on Vol. I were definitely the first tunes we wrote together, we were listening to a lot Junior Kimborough, R.L Burnside and all those guys - so we had a more garage-blues style. Once we started getting more gear and messing around with recording and production, we started writing tunes that made us actively think about the ways we could record, mix, then replicate the different parts live with just the two of us. Vol. II was the product of us trying to steer away from what people would expect a two-piece to sound like and mix those elements with a more psychedelic edge. What’s next for The Hum Drums? Jake: We'll be launching both the EPs at the Grace Darling Basement on May 11th and then hiding out for a bit to record some new stuff we've been working on. Greg: We'll be cooking up Vol. III real soon and then will hopefully play a few headliners in the later half of the year! Check out 'MAKER/BREAKER' above, and to keep up to date with all things Hum Drums (including the release of Vol. II and their double EP launch) follow them on Facebook.